As yesterday’s post concluded, “Quality” is appropriately a critical focus for innovative organizations, but, in practice, most definitions of this concept are incomplete. Quality often is interpreted narrowly as our ability to deliver “Quantity without Errors”, minimizing mistakes and maximizing consistency. In practice, this is an important but insufficient way to define this important concept. Quality should not merely be about the assurance of “Perfection”, but also should encompass the importance of delivering “Excellence” or “Amazing” as well. When all is said and done, what truly is the purpose for focusing on quality in our innovations? While important, it is not merely about preventing defects, minimizing costs, or even about maximizing efficiency. While those are all factors, these are the trees and not the forest. The true overriding goal of optimizing Quality is to maximize the VALUE to our consumers so as to deliver optimal PROFIT to our business. Period. If we can design, invent, and deliver propositions of a superior value then we ultimately will have a sustainable and profitable business. 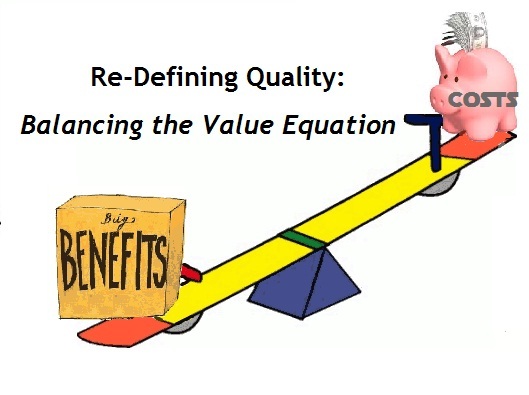 Essentially, quality is about maximizing the value equation both through maximizing “excellence” in delighting our consumers, while also minimizing costs through driving financial and organizational efficiencies. Essentially, the quality of our innovation can be measured by the overall ratio of the degree of consumer benefits that we provide versus the costs of providing that benefit. In this case, I would define “Benefit” as, at minimum, the degree to which a need or want is satisfied. Going beyond that… delivering against an unmet need, satisfying a new “job to be done”, or delivering and amazing “Wow” experience all represent ways to exponentially increase the Benefit. The “Cost” can represent not only money, but also time, resources, effort, and complexity. “Cost” often is the part of the equation most associated with operational definitions of Quality Assurance today. The trick in this equation is that the delivery of “Benefit” and “Cost” are not independent variables, particularly in programs which require a stretch outside the typical innovation “box”. On one hand, the pursuit of an increase in benefits so as to deliver a “Wow” typically comes with an increase in “Degree of Difficulty”… and this “Degree in Difficulty” ultimately leads to an increase in costs and complexity. On the other hand, the pursuit of reductions in Cost typically come with reductions in risk, uncertainty, and degrees of freedom… and these reductions will ultimately limit the ability to provide an increase in benefits. Net, in the pursuit of “Quality”, a focus on Costs tends to work against Benefits, and a focus on Benefits tends to work against Costs. Both of course are important… an investment in Benefits ultimately leads to greater consumer delight and an increase in overall sales, while an investment in Costs leads to improved organizational efficiency and an increase in profitability. Delivering value to the consumer and to the business will come through both increasing the quality of benefits and in decreasing the costs… the question is, which comes first? Which Comes First? Delighting the Consumer or Delivering Profit? This may be the most important question of all, as the answer to which will drive the focus of not only our innovation programs, but of our organizational cultures as well. At the end of the day, what is the purpose of our organizations and thus of our innovations? It often is argued that the fundamental purpose of a company is to deliver profit. Said another way, a corporation’s primary objective should then be to maximize value to its shareholders through making as much money as possible. Clearly, profit is important and a company will not continue to exist much less be successful without making money. That being said, I believe that a stated purpose of “maximizing profit” is fundamentally flawed, and ultimately will be destructive to the long-term success of the business. Yes, profit is critical- but it is an output and not a purpose. Our purpose fundamentally must be to maximize consumer delight and satisfaction, with profitability as an output that flows from successful delivery of this purpose. While this may sound like semantics, I assure you that it is not. Much has been written about Steve Jobs and his approach to leading Apple as well as the legacy that he left behind. One of the critical themes of his approach was to delight the consumers first and the “shareholders” second. Essentially, first figure out how to make something “Amazing” and then figure out how to make it profitable. Particularly for innovators, if profit becomes the primary objective then choices will be made to minimize… reducing costs, reducing complexity, and reducing risks so as to drive profit through improving the bottom line. The problem is that all of this minimizing, while potentially driving short-term profits, will ultimately also minimize the ability to deliver breakthrough, new, and superior products to the consumer over the longer-term. If on the other hand, the primary focus is on consumer delight, the innovators will focus on maximizing…improving the consumer benefits, satisfying unmet needs, and delivering an amazing “Wow” experience. While in the short-term, this approach will likely have a negative impact on profit as it requires increased investments, in the longer-term this will ultimately serve to maximize not only growth to the top line, but to the bottom line as well. This is by no means saying that our innovations should not ultimately be optimized for profitability- rather this is to say that we should first deliver an amazing, delightful benefit to the consumer and then maximize its profitability… and not vice-versa. So… as your organization focuses on quality, how much time is spent working on the numerator (Benefit) versus working on the denominator (Cost)? Typically, I would argue, that a disproportionate amount of time is spent on minimizing “Cost”, both in that is easier to dimensionalize and measure and that it is, at least on paper, lower risk and complexity. Net, quality programs are often focused far more on being free from “defects, deficiencies, and significant variations” and less on insuring delivery of “excellence” in innovation potential. To ultimately maximize the quality of our innovations and thus the value that we deliver, we should broaden our scope of “Quality” to focus first on delivering superior benefits and then second on superior costs. While this investment will have short-term challenges, the long-term benefits to the business will be dramatically enhanced. To complete this topic on “Quality”, tomorrow’s post will focus on ways to deal with the “Perfect is the Enemy of Amazing” paradigm… further emphasizing the strategy of “First Amazing, Then Actionable”, and Thursday’s will conclude with a discussion on how “We are What We Measure”. As always, I welcome your thoughts, feedback, and ideas.